Ottawa-Glandorf’s Erin Kaufman goes up for a shot against Kenton’s Jenna Manns during Thursday night’s Western Buckeye League game at Ottawa-Glandorf. Kenton’s Jenna Manns puts up a shot during Thursday night’s Western Buckeye League game at Ottawa-Glandorf. OTTAWA — It’s all starting to wind down for Ottawa-Glandorf senior Erin Kaufman. But she’s got plenty of basketball left in the meantime. 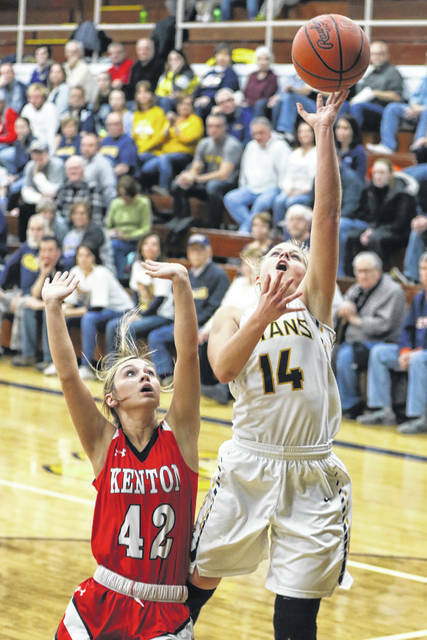 Kaufman tossed in a career-high 30 points to power the Titans past Kenton 73-46 in a girls basketball game Thursday at Hermiller Gymnasium. With the victory, the Titans clinch at least a share of the Western Buckeye League title. It marks O-G’s fourth straight WBL title. The Titans are 19-1, 8-0 in the WBL. Kenton is 3-15, 1-6 in the WBL. Kaufman hit five 3-pointers to help her pass her previous career-high for points of 24. She scored 10 points in the key second quarter, then tossed in 13 in the third quarter. Kelsey Erford had 12 points and seven rebounds for O-G. Freshman Erin Kaufman, a 5-11 post player, had 10 points and 10 rebounds. 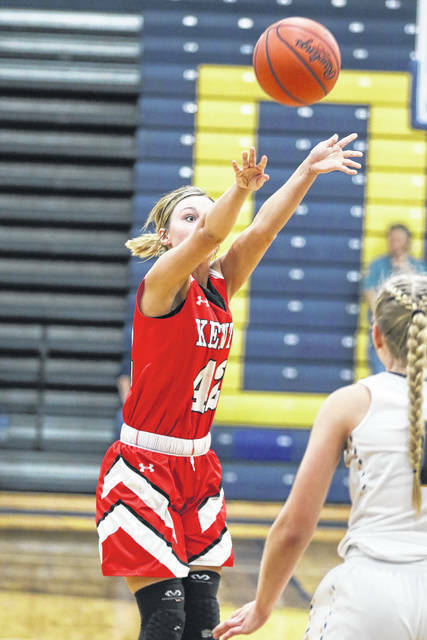 Jenna Manns had 17 points with five 3-pointers for Kenton. She left the game in the final quarter with an injury. Sidney Plott had 12 points and two threes for Kenton. O-G’s defense was the key to the game, as it forced 29 Kenton turnovers. O-G won the boards, 34-29. O-G needed a quarter to shake off the emotion of the senior night hoopla. That, and Kenton hit 5 of 8 on 3-pointers in the first quarter. That helped the Wildcats run out to a 9-2 lead. Kenton led 21-9 after Manns drilled her third straight 3-pointer. That came with 1:52 left in the first quarter. Kenton led 23-14 after the first quarter. Schroeder did start as a senior, but came right out seconds into the game. The Titans cranked up their man defense and threw in some man pressure off the press. The result was O-G outscored Kenton 15-5 in the second quarter. Senior Erin Kaufman scored 10 points in the second quarter. Her second 3-pointer of the quarter gave O-G the lead for the first time 29-28 with 44 seconds left before halftime. It was announced on senior night that Kaufman will attend the University of Toledo next year and study nursing. She won’t be playing basketball in college. Kenton had 14 turnovers at the half, with nine coming in the second quarter. The Titans put the foot hard on the accelerator in the final quarter. They outscored Kenton 30-6 in third. They had a 13-1 run to start the third and ended the quarter on a 17-0 run, with the press-and-run game in high gear. This entry was tagged kenton, ottawaglandorf. Bookmark the permalink.